If you were watching the Washington Redskins game tonight you would have seen NASCAR driver Dale Earnhardt Jr in the TV booth with Joe Theismann and Kenny Albert. If you listed to the game on the Redskins Radio Network you would have heard him on your radio dial. This surprises me none as I thought it was promotional appearance as NASCAR will be visiting the Virginia area in about ten days. He was taken onto the field by Redskins owner Dan Snyder before the game and then made his rounds to the TV and radio networks. 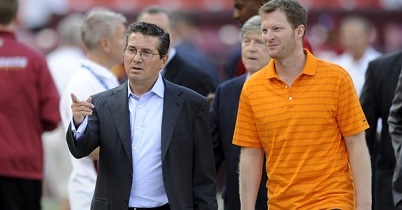 I was totally wrong though apparently Dale Jr is a huge Redskins fan. Junior is currently third in the NASCAR point standings and I guess decided to take time out of his schedule to watch his favorite team. How is this his favorite team? I have no clue as he was born and raised in North Carolina. Well regardless, that’s his team according to him. I’m wondering out of all the things he did today what was his favorite part. Was it a chance to get onto FedEx Field during the pregame hours? Or was it speaking to Joe Theismann and getting a signed jersey of someone who should be his idol if he actually is a Redskins fan? Oh and Junior fans I think we now know why he always flops during the Chase. He spends too much time thinking about what way the Redskins are losing that given day instead of the track and drivers in front of him.